Neve Maslakovic: A duck. And a birthday hat. A duck. And a birthday hat. Anyway, the duck with the birthday hat is here because it's been a year since my debut novel came out. 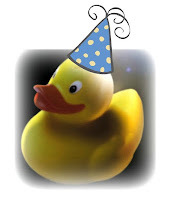 Thank you to everyone who bought the print or Kindle version of Regarding Ducks and Universes in the past year, or borrowed it from a library, or left a review, or sent me a kind note, or left a comment saying you enjoyed reading it. You guys are great! I’ve been getting a lot of questions about the next book -- for now all I can say is that there are things in the works. That's all I can say mostly because that's all I know for now. Stay tuned. More to come.